Ear Piercing Ceremony Muhurat 2014 or Karnvedh Sanskar Muhurat 2014 is something very important for every couple who is going to offer their child with his/her very first earring. Keeping in mind all the essentials of Ear Piercing Ceremony, AstroSage has come up with Karnvedh Sanskar Ceremony Muhurat 2014. Ear Piercing Muhurat 2014 is for all of you who are looking forward to present their child with their first pair of earrings. Karnvedh Sanskar Ceremony Muhurat 2014 is presented here to tell you the best date, days and Nakshatras to perform this ritual in 2014. Karnvedh Sanskar Ceremony is known as Ear Piercing Ceremony in the modern world. According to Hindu customs, Karnvedh Samskara is a major ceremony and is one among the sixteen sacraments (Shodasa Samskaras). Ear Piercing Ceremony or Karnvedh Ceremony is done after choosing an auspicious day and time. After choosing the best Ear Piercing Ceremony Muhurat, the ritual is carried out under sunlight with Pujas and prayers. Once the ceremony is done, earrings are offered to the child. Karnvedh Ceremony is considered auspicious, if done when the child is either six or seven years old. 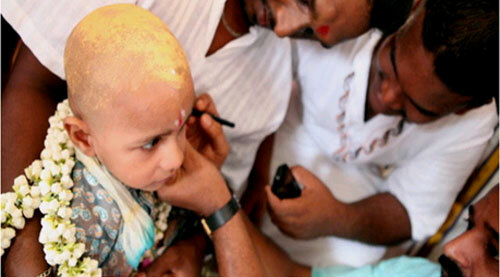 However, according to some customs, Ear Piercing Ceremony is done when the child is three, five or seven years old. A nunber of sources will help you to get familiar with Ear Piercing Ceremony Muhurat for 2014, but they may fail in explaining the right manner of performing Karnvedh Sanskar Ceremony. Here, in this 2014 Ear Piercing Muhurat, you will get knowledge about each and every thing related to Karnvedh Ceremony. Importance of Karnvedh Samskara Ceremony comes from the fact that in Hindu tradition, a pierced ear symbolizes a cultured family. In some families, Ear Piercing Ceremony is conducted only for the girl child; whereas, in others it is done for both girls and boys. Once the ritual is done, girl child retains the holes for wearing earrings throughout her life, while the boy lose them. Ear Piercing ritual is in practice since ancient times. Ancient books such as Samskara Prakasa, Baudhayana Grihya Sesa Sutra and Grihya Parisista explain Karnvedh Sanskar ritual. Susruta, the ancient book about health and longevity says Ear Piercing protects the child from various diseases. Above mentioned Karnvedh Ceremony Muhurat 2014 table has covered every detail about Ear Piercing Ceremony Muhurat for the year 2014. In 2014, let's understand Karnvedh Sanskar Ceremony more clearly with the help of details explained below. For most of us, Ear Piercing is just an ordinary Hindu ritual, but it is also believed that Karna Vedh has immense scientific importance as well. Karnavedha Ceremony or Ear Piercing Ceremony is performed on a holy day, after some astrological calculations. This Ceremony can be performed either in a temple or in home. After a purificatory bath, the child is dressed well in new clothes. To conduct Karnvedh Ceremony, "Guru" of the family is called. A surgeon is also called as he is the one who performs the Ear Piercing rituals. In case of girl child, left ear is pierced first; whereas in boys, it is the right ear which is pierced first. Holy verses from the scriptures are chanted during the Karnvedh Sanskar Ceremony. Also, some mantras are whispered in the ear of the child and prayer is made for his/ her bright future. After Ear Piercing is done, ointment is applied to heal the wound. Brahmans are fed and charity is made to them at the end of Karnvedh Ceremony. In some regions, Ear Piercing Ceremony is carried out by the Goldsmith and earlobe is pierced using gold needles. Ear Piercing Ceremony is performed by all the Hindus, irrespective of their caste and gender. We hope you will follow the auspicious dates mentioned in Ear Piercing Ceremony Muhurat 2014 table. Our Karnvedh Ceremony Muhurat for 2014 is prepared by our panel of experts keeping in mind the customs of Ear Piercing Ceremony. In 2014, let your child get his/her Karnvedh Sanskar Ceremony done under the most favorable muhurat with our Ear Piercing Ceremony 2014.